KYANGWALI, Uganda: The attackers wore masks and used axes, machetes and guns to slaughter civilians in the Democratic Republic of Congo’s strife-torn Ituri province, says Areiti, a mother of seven children. The morning the violence hit her village of Joo, she had no time to prepare her family’s escape. “I saw how they were killing people,” the 37-year-old says. Areiti and her children braved a journey to the shores of Lake Albert. And like some 57,000 other people who have fled renewed violence in Eastern Congo since mid-December, they crossed the lake and sailed to Uganda, in search of safety and a chance at life. In order to pay the fishermen who took them across the lake, they had to sell their only goat. 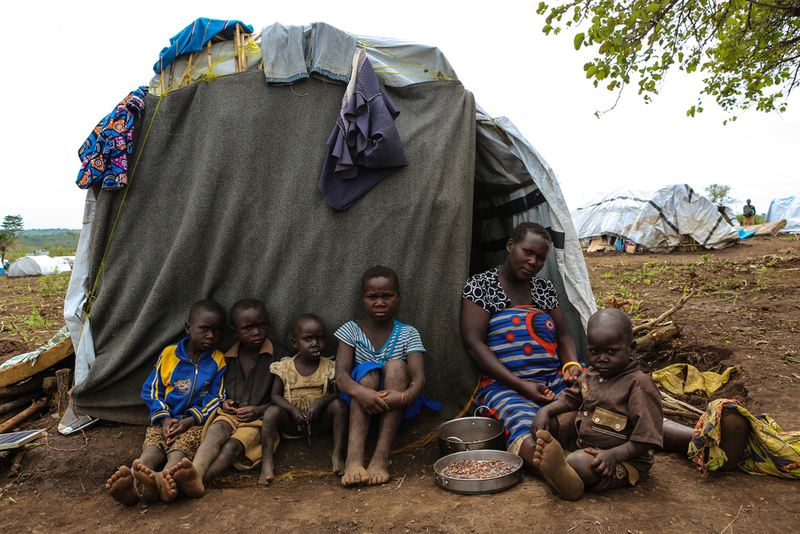 Now, Areiti and six of her children have very little to survive on as refugees in Uganda, where they have been living since February 2018. For Areiti, the pain of exile is exacerbated by the fact that the violence separated her from her husband and one of her children. They hope to be reunited, though as the killings rage on in DRC, it is hard for her loved ones to find an escape route. For now, she and her six children live in hope that their family will be whole again, as they try to forget the horrific scenes they survived. Areti, 37-years-old from a village called Joo (Mahagoi) in Ituri province. “We have nothing, I don’t even have cups to drink water from"
When families like Areiti’s reach the Ugandan shore, they travel by bus to the reception centre at Kagoma for registration. This can take several weeks, as the centre is overcrowded, hosting 6,000 people in a space built for hundreds. Many of the new arrivals have nowhere to sleep but in makeshift hangars made from wood and plastic sheeting. In these hangars, men, women and children of all ages share mattresses and bamboo rugs, sleeping back-to-back to make room for each other. The lucky ones were able to transport plastic chairs, jerry cans and buckets over from DRC. Most came with nothing but the clothes on their backs, and are desperate for help. Under such precarious conditions and with limited access to clean water and latrines as the number of new arrivals overwhelmed reception facilities, the cholera outbreak which started to spread mid-February has taken a daunting toll among the vulnerable refugee population. As of the end of March, cholera has already left at least 39 people dead and 1955 severe cases admitted in dedicated health structures. The risk of a measles epidemic is also very real. MSF set up an out-patient clinic inside the reception centre and is vaccinating all the newly arrived children against measles to mitigate those risks. For Janet, a 30-year-old mother of three young children, arriving on March 9 at Kagoma brought little respite. “We have nothing, I don’t even have cups to drink water from,” says Janet, whose family fled the Congolese village of Tchomia. Her husband is also missing because of the violence in Ituri province. “My children and I are suffering here. One of them is sick, we are all in trouble,” she says as she seeks medical advice at an MSF clinic. Like everyone else here, she battles terrible memories of home as she struggles to keep her children alive and well. “Many people were murdered with guns and some of their bodies were cut in half using axes. Others were hit with arrows,” she says. Janet recalls getting on a boat with her children and looking back at the Congolese shore over the water, only to see whole villages ablaze. 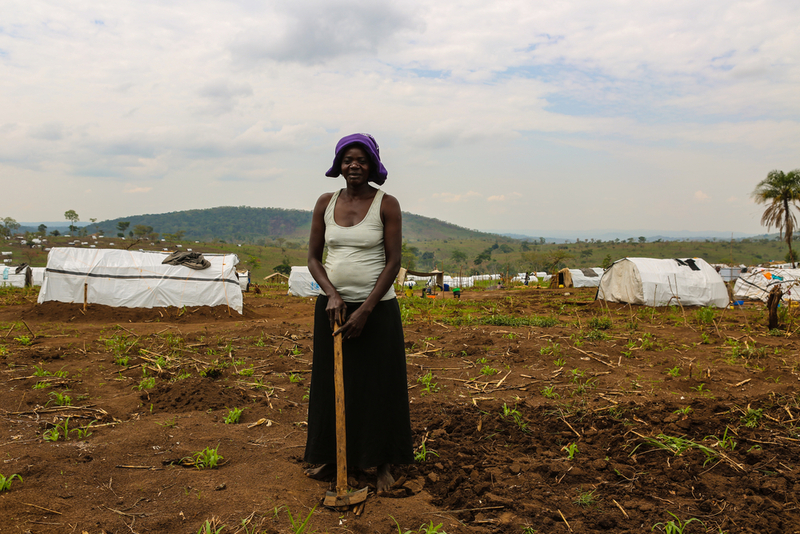 While she and her children are now safe from the kind of violence that was engulfing their home region of Ituri, they now have to get used to waiting for registration, before they can be sent to the camp. The camp of Mara Tatu, a short drive away from the reception centre, is located on a fertile area of western Uganda, some 250 kilometres from the capital Kampala. Over 75,000 refugees live in camps in the area, including some 40,000 Congolese newly arrived from Ituri, mostly women and children. In the camp, new arrivals are given little more than plastic sheeting to build the makeshift tents that will be their home for at least the first few weeks. Those who have been there longer gather wood and try to build more permanent structures. The main difference between the camp and the reception centre is that the camp is far more calm, and there is space — for now — for everyone. But the stories the refugees tell here are just as violent. Emmanuella, a 42-year-old woman, fled Ituri with her husband and five children, after their home village of Tara was attacked by a militia days around Christmas of 2017. Before fleeing to DRC, Emmanuella’s family tried to shelter in the neighbouring town of Tchomia, but that too was attacked a fortnight later. Emmanuella and her family now live in Mara Tatu, with no prospect of returning home. The situation in DRC shows little sign of abating, and refugees like them have no choice but to accept being far from home for the time being. Emmanuella 42-Years-old from a Tara village near the town of Tchomia – Ituri province in DRC. So for now, she tries to be the best possible mother for her children.